Gathered one summer in a beautiful shoreline town, three generations are drawn together by their patriarch. 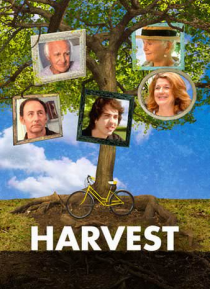 With endearing moments of humor and uplifting spirit, HARVEST is a portrait of a family awkwardly yet delicately hanging on to what was, what now is, and to one another. A superb ensemble cast, including Victoria Clark, Arye Gross, newcomer Jack Carpenter and also featuring Barbara Barrie tu… gs on heartstrings and reminds us of a love that can weather all storms in this poignant yet amusing story.